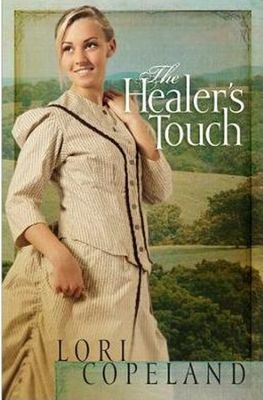 The Healer’s Touch by Lori Copeland is by far the most unusual novel I have read in the last year. In fact, if you are tired of the same sort of love story, this may just be the book for you. What was most interesting to me about this title is the unique tie to the local folklore of the Ozarks. This book is an example of why it is so important to read the introduction to a book before you read the book! Had I just plowed into chapter one, I would have wondered what in the world the author was thinking! In this story, Lyric Bolton drags in the scoundrel who busted up her barn into her home so that he might die comfortably. Hopeful to collect the bounty he might have on his head, she waits out his death….only he doesn’t die. The outlaw who is actually a U.S. Marshal with amnesia was a victim of the local “spook light” that no one can explain. Lyric nurses the stranger back to health all the while building an unexpected relationship with him. I was very interested to hear Lori Copeland describe the tale of the strange light that lives in the woods of Missouri. It definitely helped me stay interested in the novel, even though I usually don’t have an appreciation for scary stories. While this wasn’t my favorite read this summer, I can appreciate the way Copeland tells a story. She is a talented story writer who I would read again. This book is available for purchase August 2014. I was given a complimentary copy of this book by NetGalley in exchange for an honest review.